Our selection of spinning wheel games, game wheels and prize wheels includes sizes ranging from 14 inches in diameter to 40 inches in diameter. 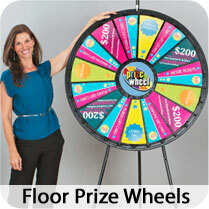 Each of these exciting spin wheels can be customized with your own graphics, colors and prizes, along with your logo in the center of the wheel. You can view pictures of our games in action here. People love to spin our game wheels. After all... everyone loves to win. Whether a business is looking to increase productivity, improve the effectiveness of presentations or provide a little fun for employees after a difficult project, a spin wheel can do it all. 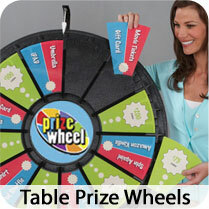 Spinning game wheels are an effective tool for marketing and so much more.